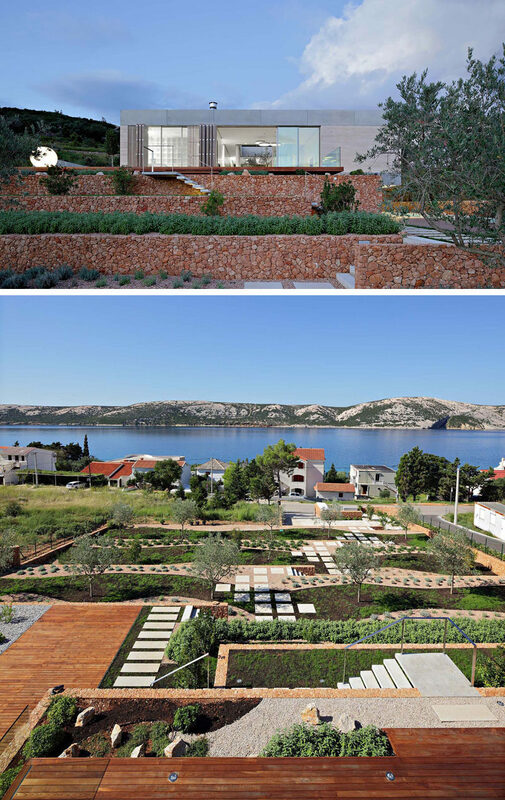 Architecture firm LOG-URBIS have designed a house on a sloped site on the island of Pag in Croatia, that has a terraced landscaped yard, a long swimming pool and water views. From the street, the house looks to be a single level home, however a second, lower level is hidden from view. The house features a large landscaped outdoor space, with a Mediterranean terrace garden full of plants and paths with retaining walls built using red parparot stone that’s native to the island. From the street below, the garden rises over 19 meters (62 feet) above sea level, providing a sea view and overlooking all houses on the coast. 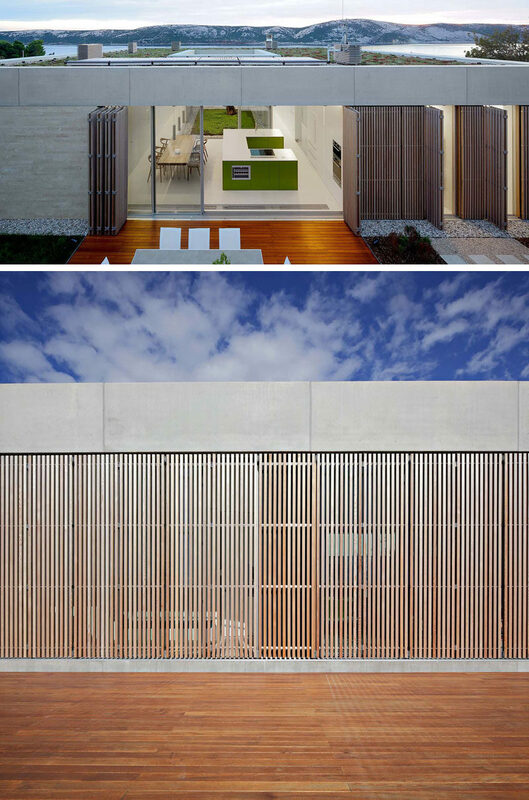 The exterior of the house uses a variety of materials that include smooth concrete facia beams, Travertine stone walls with a small, horizontal stripe pattern, vertical wooden brise-soleils, and large sliding glass walls with minimalistic natural anodized aluminum frames. To the side of the house, there’s a covered terrace and a linear 55 foot (17m) long outdoor pool. Beside the pool is a deck with an outdoor lounge that sits at the entrance to the gym/spa area of the home. 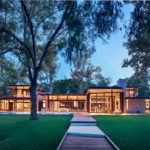 The home was designed for everyday living of a married couple, with frequent visits from their adult children and friends. 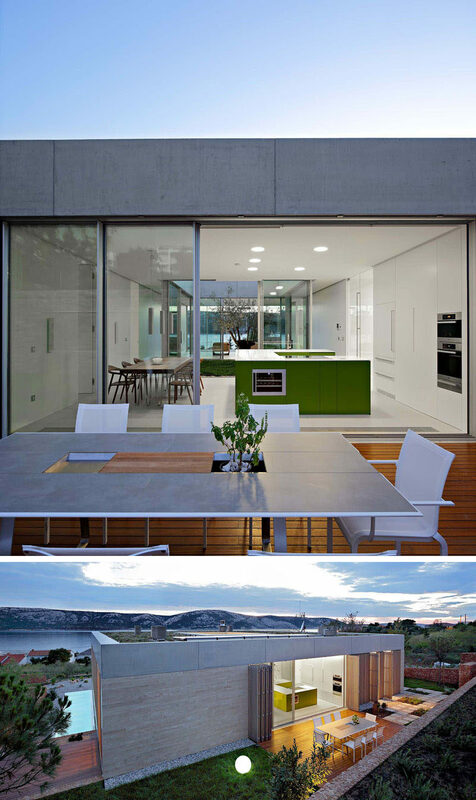 In the upper floor of the home is a living room, that overlooks the garden. Behind the living room is a glass atrium with a single olive tree, that’s the heart of the house. All of the different living areas of the home surround the atrium and it’s a place where the boundary between the interior and exterior disappears. On the other side of the atrium is the kitchen. 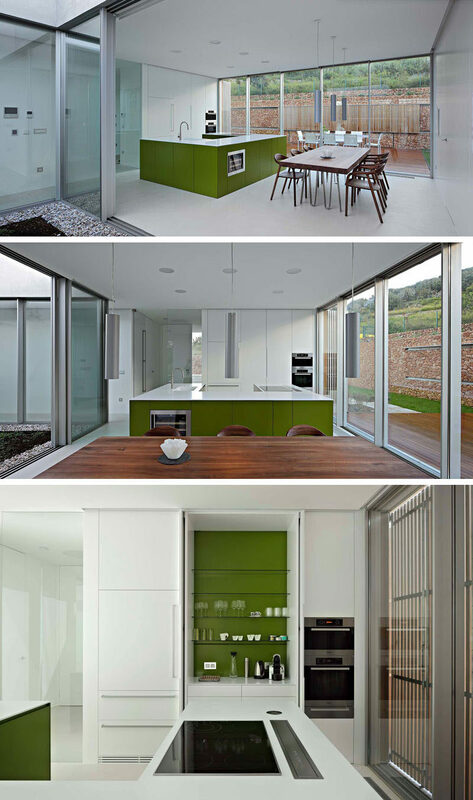 An island with an olive green base and a white counter compliments the white cabinets, that when opened, have an olive green interior. Off to the side of the kitchen and dining room is a teak wood deck that’s been set up for outdoor dining. 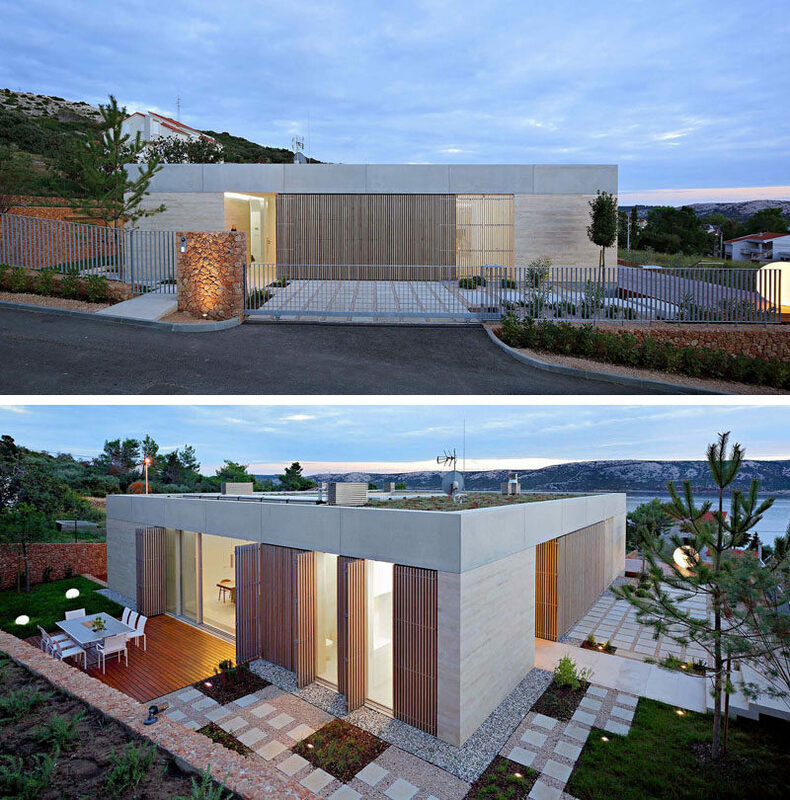 At night, vertical cedar wood brise-soleils can be closed to provide some privacy and security. Some of the rooms, like this study or home office, can be accessed from the deck or from within the house. A custom furniture piece named nap’n’work was designed to have dual functions that include a desk to work on and a day bed to nap on. In the lower floor of the house, there’s a wine cellar with custom built shelving with pull-out displays to show off the wine. Here’s a look at the roof of the home which is flat. It’s been planted with a green roof, featuring eight varieties of sedums of different colors and in-bloom seasons.